Hi, I’m Captain Lewis Hoops, but you can call me Lewey, all my friends do. We live at Lemur Landings on Tower Park, just a short swing from Poole and Bournemouth.  Lemur Landings is one of Dorset's largest indoor children's entertainment, soft play and themed party centres and I can’t wait for you to come and play here. We have some great new features at Lemur Landings, including a totally awesome role play village, climbing zone with its own Digi-Wall and lo-ropes for little ones called Sky Tykes. It's such a fantastic place to explore, learn and play. We lemurs do love to party, and I’m no exception, we have lots of kid's party celebrations here and I just can’t resist popping along whenever I can to wish you a totally brilliant birthday party with your friends and family. Call us with any questions or to book.